Now first thing you may ask is that , whats the benefit or features of this software . As the name clearly suggestSpeedUpMyPc helps you make your computer faster by tweaking the settings of your windows. It analysis your CPU, ram, process and uses its tools to optimize them for maximum performance. The interface of the software is very simple to use . The actual price of the software is 39$ but using the promotional method I am giving you will get it for free with the serial key which is valid for 1 year. 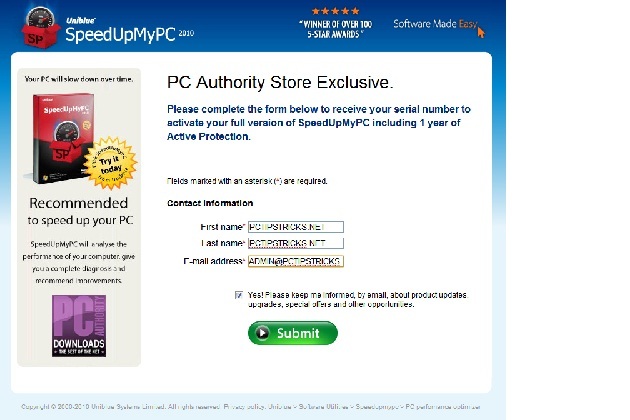 Note: Although you will receive the license key for SpeedUpMyPc 2010 version but the same key also works for 2011 version. You will receive the license key at your email address. I have tried but it is not working. One message came as "the serial number you entered is invalid."